Thank you for your interest in this fellowship and your time in looking over our web site. Gospel Alliance Ministries is comprised of those serving in various aspects of promoting the Gospel of Christ with the purpose in mind to reach a lost and undone world. 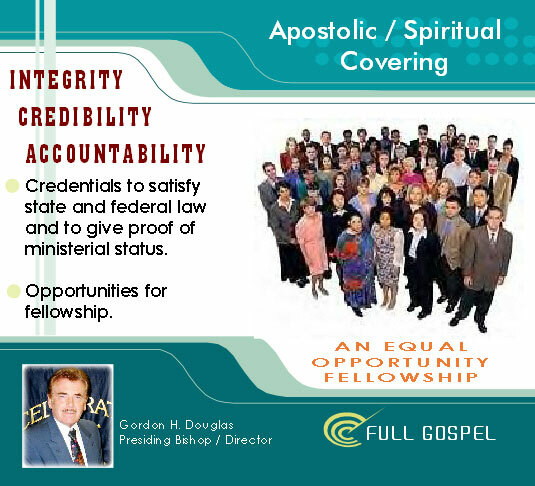 GAM stands ready to provide a spiritual/apostolic covering to those desiring such. GAM provides appropriate ministerial credentials to satisfy state, federal and international law as well as giving proof of clergy status. We serve those that desire to have a "home" for accountability and credibility that lends itself to integrity. This is provided without the hierarchy control sometimes imposed by denominations. If you have any questions after reading over the information on this web site please contact us. You may do so by email, telephone or FAX. Thank you and God bless. We look forward to hearing from you. This conference is cohosted with Gospel Ministers & Churches International. Additional information will be posted in near future. If you have questions about the annual meeting please contact us by email or telephone.